Installing XTDir for SobiPro is no different than installing any other Joomla!™ extension on your site. You can read the complete instructions for installing Joomla!™ extensions on the official help page . Throughout this chapter, we assume that you are familiar with these instructions and we will try not to duplicate them. Please note that installing and updating XTDir (and almost all Joomla! extensions) is actually the same thing. If you want to update XTDir please remember that you MUST NOT uninstall it before installing the new version! When you uninstall XTDir you will lose all your settings. This is definitely something you do not want to happen! Instead, simply install the new version on top of the old one. Joomla! will figure out that you are doing an update and will treat it as such, automatically. If you find that after installing or updating XTDir it is missing some features or doesn't work, please try installing the same version a second time, without uninstalling the component. The reason is that very few times the Joomla! extensions installer infrastructure gets confused and fails to copy some files or entire folders. By repeating the installation you force it to copy the missing files and folders, solving the problem. The easiest way to install XTDir is using the Install from URL feature in Joomla!. First, go to our site's download page for XTDir. Make sure you are logged in. If not, login now. These instructions won't work if you are not logged in! Click on the version you want to install. Please note that the latest released version is always listed first on the page. On that page, you will find XTDir. Next to the Download Now button you will see the DirectLink link. Right click on it and select Copy link address or whatever your browser calls this. Now go to your site's administrator page and click on Extensions, Extension Manager. If you have Joomla! 3.x click on the Install from URL tab. Clear the contents of the Install URL field and paste the URL you copied from our site's download page. Then click on the Install button. Joomla! will download and install the XTDir update. You can download the latest installation packages from our site's download page for XTDir. Please note that the latest version is always on top. Click on the version you want to download and install. Click on the XTDir item to download the ZIP installation package. All XTDir installation packages contain the component and all of its associated extensions. Installing it will install all of these items automatically. It can also be used to upgrade XTDir; just install it without uninstalling the previous release. You can download the latest installation packages our site's download page for XTDir. Please note that the latest version is always on top. Click on the version you want to download and install. Before doing anything else, you have to extract the installation ZIP file in a subdirectory named XTDir on your local PC. Then, upload the entire subdirectory inside your site's temporary directory. At this point, there should be a subdirectory named XTDir inside your site's temporary directory which contains all of the ZIP package's files. If you still can't install XTDir and you are receiving messages regarding unwritable directories, inability to move files or other similar file system related error messages, please consult our installation troubleshooting instructions. If these instructions do not help please do not request support from us; we are unlikely to be able to help you. These errors come from your site set up and can best be resolved by asking your host for assistance or by asking other users in the official Joomla!™ forums. Upgrading from any XTDir module to the full XTDir for SobiPro is by no means different than installing the component. You do not have to uninstall the previous version; in fact, you MUST NOT do that. Simply follow the installation instructions to install XTDir over the existing XTDir partial installation. That's all! All your settings are preserved. When upgrading from XTDir to XTDir you usually have to install the package twice, without uninstalling anything in between. Sometimes Joomla! does not copy some of the files and folders the first time you install it. However, if you install the package again (without uninstalling your existing copy of XTDir) Joomla! copies all of the necessary files and performs the upgrade correctly. Our extensions can be upgraded just installing the new version on top of the previous version. We recommend to test the update in a development site, check the new features and test before the deployment to the live site. If you are upgrading from an old version (after skipping several versions), we "strongly" suggest to test the new version before the upgrade. Remember to create a backup before any major change. Protect your data with backup and restore processes. Akeeba's Backup is a handy tool that can easily simplify your site backup/restore tasks. You can easily check for the latest published version by visiting site's download page for XTDir. The page lists the version and release date of the latest XTDir release. You can also check it against the data which appear on the right-hand pane of your XTDir Control Panel. If your release is out of date, simply click on the Download link to download the install package of the latest release to your PC. 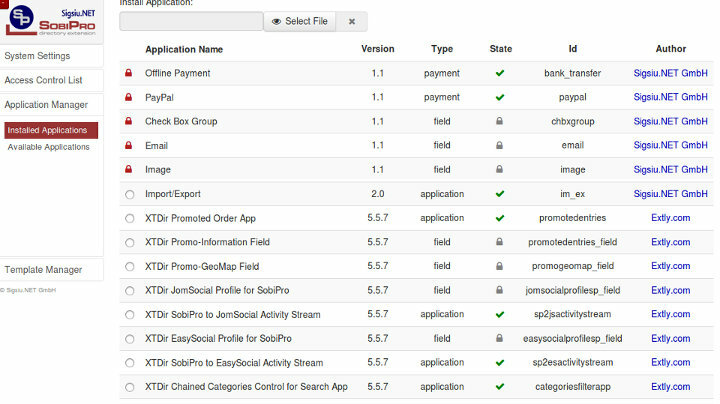 XTDir solution has a component, modules, plugins, SobiPro Apps, and SobiPro fields. XTDir component, modules, and plugins are updated by Joomla! Extensions installer. But, XTDir-SobiPro Apps and XTDir-SobiPro fields, which are manually installed from XTDir, must be manually updated from XTDir following the same procedure. After a XTDir update, please, remember to also update XTDir-SobiPro optional Apps and XTDir-SobiPro optional fields to the same version, in SobiPro App Manager. Visit each associated XTDir configuration area and click the Update button for the app or field. If there is an update available for XTDir tick the box to the left of its row and then click on the Update button in the toolbar. Joomla! will now download and install the update. XTDir needs you to set up the Download ID before you can install the updates. You can find your main Download ID , in your Account/Your Download ID . Then go to your site's administrator page and click on Components, XTDir, and click on the Options button in the toolbar. Click on the Live Update tab and paste your Download ID there. Finally, click on Save & Close. As noted in the installation section, installing and updating XTDir is actually the same thing. If the automatic update using Joomla! 's extensions update feature does not work, please install the update manually following the instructions in the installation section of this documentation. When installing an update manually you MUST NOT uninstall your existing version of XTDir. Uninstalling XTDir will always remove all your settings. You definitely not want that to happen! You can uninstall the main component just like any other Joomla! component. In your site's back-end, just go to Extensions Manager, click on Uninstall, select XTDir and click on Uninstall. This will completely remove XTDir including all plugins and modules. Finally, XTDir has a component, modules, plugins, SobiPro Apps and Fields. Joomla Extenstons Manager can uninstall native extensions, but XTDir-SobiPro Apps and Fields have to be uninstalled from SobiPro Application Manager. To complete the uninstallation, visit SobiPro Application Manager, and remove all XTDir Apps and Fields.